Purchasing an LCD monitor can be a difficult task at the best of times. Knowledgeable buyers have to consider many aspects of their future screen, not just basing a decision on price and marketing hype. Of course decisions are ultimately driven by a buyers budget, but one must always consider the things which will make the screen suitable to their uses, which are where technologies, features, connections and design come into play. Panel technology is not always discussed by manufacturers but is one of the most important aspects to consider when buying a new screen as it will tell you a lot about the real-life performance you can expect from the display, and ensure you are buying a screen suitable for your requirements. Fortunately we are here to help and you can read our in depth panel technologies article to help you in your quest. One thing which many buyers will be unaware of is that all LCD displays are supplied with a protective filter layer on the front of the panel itself. This coating is used to protect the panel from damage, filter and diffuse the light output and in many cases reduce glare from other light sources in your workspace. What is also tricky to understand is that different panels can have different types of coating, varying considerably by panel technology and manufacturers. This article is designed to help highlight some of those differences so that readers can make an informed decision about their next monitor purchase. The most common type of protective coating is ‘Anti-Glare’ (AG). This is often described as a matte coating as it is non-reflective to the user since it diffuses rather than reflects ambient light. It provides a method for manufacturers to avoid glare on the viewing surface from other light sources and has been used in the LCD monitor market for many years since the first TFT displays started to emerge. This matte coating is included as an outer polarizing later which has been coarsened by mechanical or chemical processes. This achieves a surface coating which is not smooth and so can diffuse ambient light rather than reflect it. What is particularly important to understand is that this AG coating can be applied to panels with varying thicknesses, which has an impact on the anti-glare properties, but also on the underlying image of the screen. Where the coating is particularly thick and aggressive, the image from the screen can deteriorate as the light being emitted is also affected. This can have some impact on contrast and colour vibrancy and the perceived image can sometimes look dull as a result. Sharpness degradation can also occur in some extreme cases where AG coating is too thick. Users may also sometimes see the graininess of the coating, particularly when viewing white or light backgrounds. This can be particularly distracting for office work and images can look grainy or dirty if the coating is too aggressive. I would point out that not everyone would even notice this at all, and many users are perfectly happy with their screens even where aggressive AG is used. It’s just something to be wary of in case you have found problems with image quality in the past or are susceptible to it. In other cases, AG coating is applied but it is light and far less obtrusive. The polarizer is less rough and has a lower haze value. Sometimes users refer to it as “semi-gloss” to distinguish the difference between these and the heavy AG coatings. This provides anti-glare properties but does not result in the grainy appearance of images. It is not a fully glossy solution though. AG coating has long been the choice for nearly all professional-grade displays as well, helping to avoid issues with reflections and external light sources which are vital for colour critical work. In addition it should be noted that AG coating is less susceptible to dust, grease and dirt marks which can become an issue on reflective glossy coating alternatives. 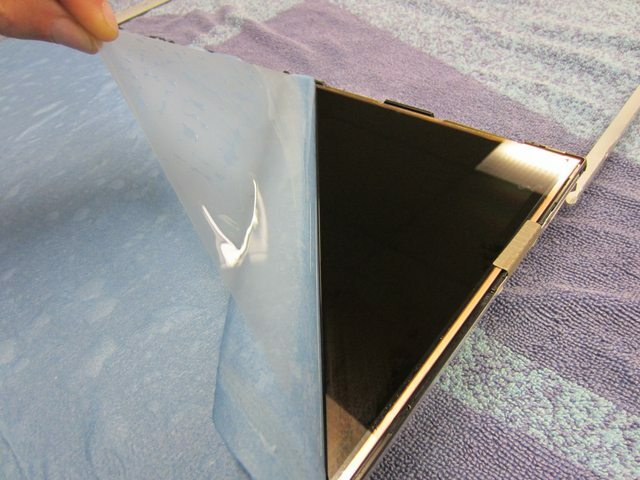 Some users have even taken matters into their own hands and removed the AG coating from their screens to produce a glossy surface. This will of course void your warranty and should be done with caution and entirely at the users risk. We mention it here as the above images are a good demonstration of the aggressive coating applied to the screen in some cases. 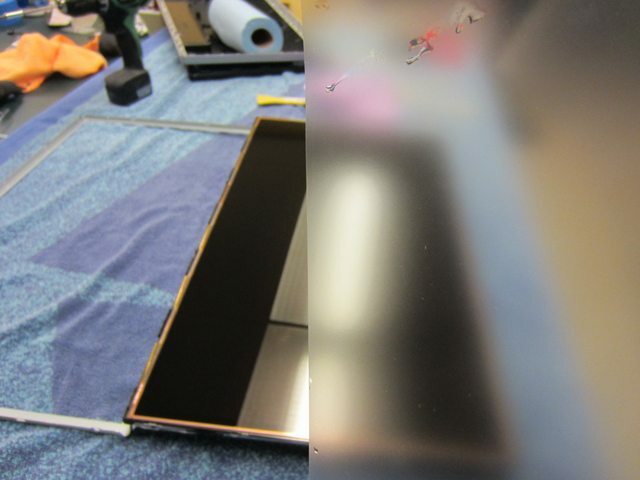 You can see from the top picture the film being peeled off to leave a glossy reflective surface underneath. The second image is of course exaggerated quite a lot but you can see how the image is affected when the photograph is taken with the AG coating in front, on the right hand side. Of course this is far less obvious when the coating is in contact with the surface of the screen but it's a fairly good demonstration of the coating being used in some cases (note, these were taken from an LG.Display IPS panel on the Dell U2312HM). It is important to realise that different manufacturers tend to use different levels of AG coating, often linked to the panel technology they are developing. See our following sections for more information about specific panel manufacturers and technologies. 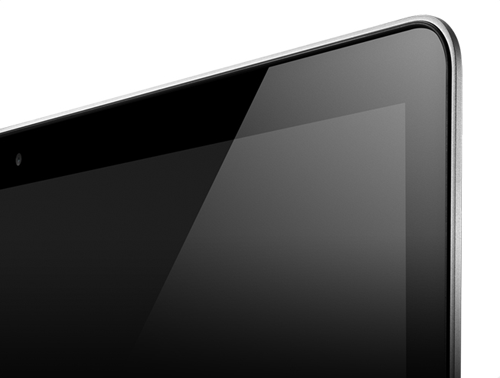 As an alternative some manufacturers choose to supply their screens with a glossy screen surface. This gives somewhat of a “wow factor” when you first see the screen and has often been used by manufacturers like Apple for their screens and tablets. The glossy panel coating is sometimes combined with a glass protective layer to give a hard exterior surface to the display and to emphasise that overall glossy appearance. Glossy coatings provide very clear, clean and crisp images, free from any form of graininess or dirtiness you might see from AG alternatives. Images can look and feel nicer in some cases, often helping colours and blacks “pop” in practice. However, they aren’t without their own problems as the glossy coating can cause a lot of unwanted reflections in certain conditions. You have to be very careful of your ambient lighting conditions and the position of lamps and windows near your screen. Finger prints, dust and dirt can also become an issue and are more noticeable on shiny, reflective, glossy surfaces. In some instances chemical coatings are applied to help try and reduce some of the ambient light reflections but in reality they still remain reflective in practice and very different to AG coatings. Glossy screens aren’t for everyone at all, and it would be advisable to try and see one in person in a shop before making a purchase if you can. Where glass coatings are applied as an additional protective layer buyers should also be aware that there is sometimes the risk of trapped dust or particles behind the glass which can become an annoyance over time. Some screens are completely free from this, but it’s just something to be aware of (e.g. dust issues were found on some Hazro’s HZ27WA/C/D screens where glass layers were used). 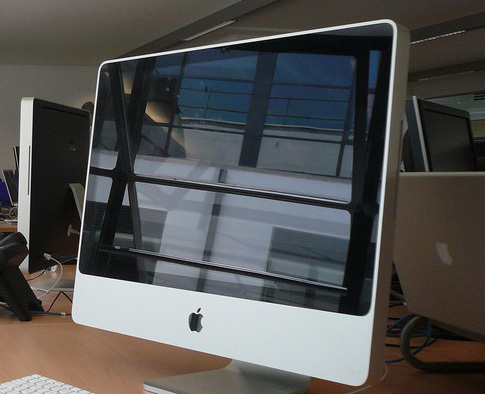 Glass layers are also often provided on touch-screen displays for that added level of protection. Glossy screen coatings have been offered over the years in several forms including older models featuring Sony X-Black, Acer CrystalBrite and NEC OptiClear technologies. Apple have used glossy coatings on their Cinema Displays for many years and in fact a lot of the modern glossy offerings are based on IPS panels. More recently other manufacturers like Hazro (HZ27WA/C/D) and DGM (IPS-2701WPH) have produced screens based on the 27” glossy IPS panels available. Samsung have also released their first glossy PLS panel in the Samsung S27B970D. LG.Display IPS – These panels are often criticised for their aggressive AG coating. Where AG is used it is normally very aggressive and some people find the images are too grainy or dirty looking. As an example the Dell UltraSharp series (U2410, U2412M, U2711, U3011) are all using aggressive AG coating on their IPS panels. Some IPS panels are provided with a glossy screen coating as an alternative which avoids issues with grainy coating, but can result in distracting reflections. AU Optronics AMVA – Modern versions of these panels are provided with a light AG coating which is sometimes referred to as semi-gloss. It is not overly grainy or obtrusive. Samsung PVA – Samsung PVA variants are also provided typically with a light AG coating which is not overly grainy. Samsung PLS – early versions of the panels were provided with a light AG coating, similar to that of AMVA panels although not quite as low haze. It was not overly grainy or distracting. More recently PLS panels have also been supplied with a glass glossy coating. The technology is in its infancy and so it is hard to establish a future trend. TN Film panels – these are nearly always provided with AG coating although some glossy models have been produced from time to time. Coating tends to vary but is normally considered to be ‘medium’ in terms of its aggressiveness. Not as aggressive as the IPS panels, but not “semi-gloss” like AMVA offerings. 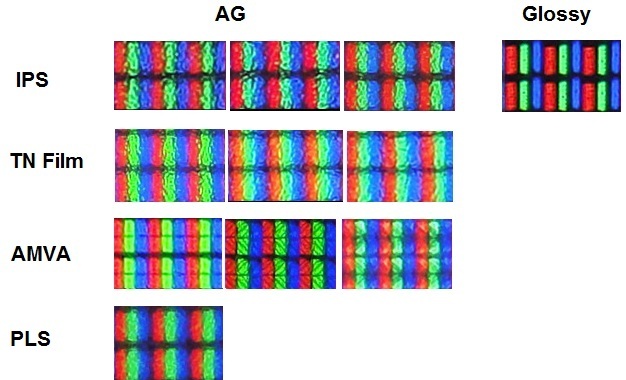 Above is a comparison of macro images taken of varying panel types. This was designed to capture the structure of the panel at a pixel level but can also be used to demonstrate the coating type being used and the resulting image clarity. You will see that the aggressive AG coating of the IPS panels leads to a blurry and grainy image, but the glossy equivalent leaves a clear and crisp view of the underlying pixels. TN Film is a medium AG coating and while not as aggressive as the IPS AG coating, it can lead to noticeable graininess in some cases. AMVA has a light AG coating and as you can see does not deteriorate the image quality too much. This hopefully gives you a summary of the common types of coating used on the main panel technologies in the market. Of course there are always variations and so we will try to discuss the coatings in our reviews so you have an idea. As a final thought I would like to reiterate the point that not everyone is bothered by the screen coating being used on their displays. This article is not designed to scare or concern people, just provide a reference point and information to help buyers make an informed decision. AG coating has been the main choice for many years now and continues to be popular with some manufacturers. While some people might be put off by the grainy coating, others may not even notice it. Glossy solutions also have their pros and cons and so it's important to try and see screens in person if you can if you worry you may be affected by any of the characteristics described here.